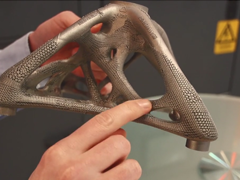 Altair, Materialise and Renishaw have collaboratively created a prototype of lattice structured spider bracket; a lightweight, functional structure which echoes biological forms found in nature. The synthesis of computational design technology with performance based lattice optimization, automatic surface smoothing and re-design with metal additive layer manufacturing, resulted in the creation of this unconventional, structurally efficient, manufacturable bracket that unleashes designing potential and creativity, freeing creators of common manufacturing constraints across the entire project from conception, product performance to its realization. The printed part shows how true bio-mimicking of 3D patterns reduces stress concentrations and produces a custom tailored design that embeds organic beauty and freedom of design.